1. Begin by preheating oven to 200°C. 2. Clean the pieces of chicken thigh meat and dry them. 3. Place the chicken on a plate and drizzle 2 tablespoons of olive oil on them. 4. Season lightly with salt and pepper. Or use a good Garlic Pepper seasoning for seasoning jobs. I like Masterfoods and Ina Paarman, depending on my location and what’s available. 5. Rub the olive oil and seasonings generously all over the chicken meat. 6. Place the pieces of chicken on a baking sheet lined with baking paper. 7. Place in a 200°C oven for 30-35mins or until the skin of the chicken is a beautiful golden brown. I like to turn the oven to top grill function for the last 5 mins to give an extra crispness to the chicken skin. 8. In the meantime, melt 2 tablespoons of butter in a hot saucepan. 9. When the butter is melted but not smoking, add 1 tablespoon of minced garlic. Stir fry the garlic in the butter for a few seconds. 10. When the garlic smells fragrant, add 400ml coconut cream or coconut milk. I like coconut cream because I like my sauce to be very creamy and rich. If you prefer a lighter sauce, use coconut milk or light coconut milk. 11. When the sauce is heated through, add 10 1/2 ounces of mango cubes. Stir well to combine. 12. Add the herbs. I like fresh dill or sliced fresh mint for this dish. 13. Add 1 tablespoon of chicken stock granules. Every brand of chicken stock is different so I always add half or 3/4 of the amount in a recipe first, stir it through, taste and then add more if necessary. 14. When the chicken is ready, remove them from the oven. 15. Add the chicken immediately to the sauce. Stir to combine. Let the sauce simmer for 30 seconds. Don’t cook the sauce for too long as the mango will soften too much and the sauce may become very thick. If the sauce is too thick, add some water to thin it. 16. 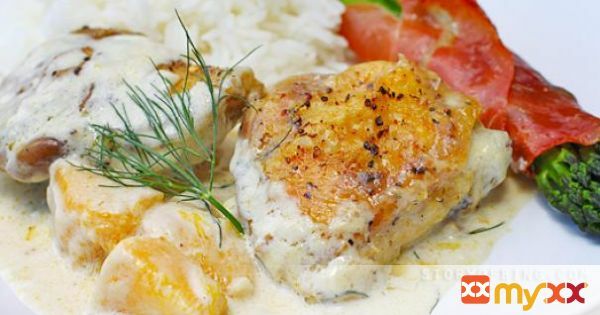 Serve with rice and vegetables or with pasta.